Those who follow manga sales are probably aware of the not-at-all-uncommon phenomenon where, following an anime that successfully catches people’s attention, every volume of the series, old and new, gets back on the Oricon weekly charts, and sometimes stays there for an extended period of time. The resulting re-chart numbers for the series can be broken down in a number of ways. I’m going to be looking on a particular test case (Nanatsu no Taizai’s performance over last Fall) which shows how those numbers can be interpreted. 1. In the first week, new fans buy the early volumes (sometimes v1, sometimes v1-v3) to check things out and see if the manga is hot stuff, or because they lack the pocket money to buy in bulk. Others with less inhibition buy the whole series. 2. Over the next week or two, fans who bought the early volumes who are now sold on the series and/or in possession of their latest allowance/paycheck, buy the rest of the series. Meanwhile, fans who waited an extra episode or two to go in for the manga get into the action, buying the first few volumes as others did a week ago, obscuring the effects of the first group’s delayed purchasing. 3. 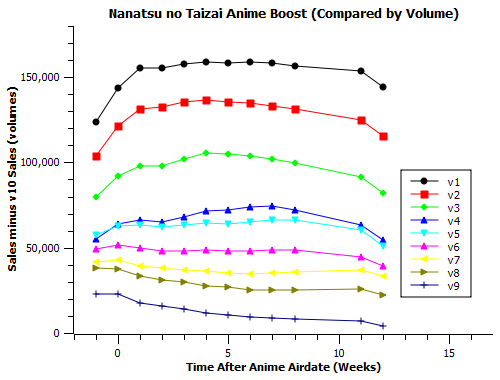 Over time, the supply of new fans from the anime tapers off and the later volumes become more prominent in the weekly charts. Of course, this data is just as it pertains to Nanatsu no Taizai. Other series can and do have different sets of fans who likely behave differently. There are other series one could compare to get a better baseline (Shingeki no Kyojin, Tokyo Ghoul, etc. ), but the overwhelming fraction of manga, even those that make the Oricon charts, don’t sell enough to get the entire series back on them for an extended period of time. What I’d really like to be able to compare would be a short series targeted more towards adults, but those less frequently get adapted, and even those that do get to re-chart in their entirety do so sporadically. Gekkan Shojo Nozaki-kun, for example, re-charted all volumes for multiple weeks, but only started doing so 2 weeks after the anime started. By that point in Nanatsu no Taizai’s run, the gaps in volume totals had already locked down in size. In theory, shorter series with more adult fans could see less delay between their fans buying the first and last volumes, but there just aren’t a lot of comparable test cases out there. *I say this in particular because I’ve encountered a decent share of people who diagnosed Akame ga Kill as an anime which produced no manga boost based on data from a volume that came out before the series aired on TV. The series in question went from selling 52,214 in 2 weeks (v10) pre-anime to 168,053 in 2 weeks (v11) post-anime. It’s not the first time such a delayed-impact boost has happened either; Binbougami ga and Toriko both got one. At least with multi-volume teen-audience series, calling it early is likely to mean calling it wrong on a regular basis. This entry was posted in Articles, Fun With Numbers and tagged Fun With Numbers, Manga, Nanatsu no Taizai by torisunanohokori. Bookmark the permalink. That’s interesting. I never considered delay impact being an issue before. A question about the chart: It the y-axis zeroed against the current week’s vol.10 sales, or the latest vol.10 sales data you have? Gives a v1-v10 value of 476099-332249=143850. If, next week, v1 gains more than v10, the value goes up, and if v10 gains more than v1, the value goes down. In a way, it’s not the ideal way to display the information because a change could result in a week when both got more sales, but it’s convenient for what’s being looked at here. If I plotted versus a constant v10 value, it would obscure the relative changes with the much larger weekly increase in totals. I believe Akame Ga Kill did present a boost. If people had instead used the total copies in circulation number from the publisher they would have seen that Akame ga Kill had completely doubled its circulation during the anime. Perhaps people shouldnt only look to Oricon for their sales data. But the pre/post-anime difference did show up there, just not immediately (in December, with the next new volume, rather than in July). The point I’m making is that oricon should only be used with confidence to measure a season’s worth of anime->manga bumps a few months after the fact. Publisher figures, though useful, are available on an inconsistent basis. I personally wasn’t aware of any publisher-released figures for Akame (would love a link to the source if you have one). The reporting on them also tends to be sparse – e.g. I wouldn’t know Ace of the Diamond had a circulation total in excess of 20 million copies if I hadn’t happened to personally buy the 41st volume (where that declaration was published). believe in the july issue it said it was at 1mln before that. Interesting. Can also check that figure against how much we expect Oricon wekkly totals to be (about 60% of the actual). So in a month (call it five weeks) they sold 900,000 units, split among 10 volumes, for an average of (900000/10)/5=18,000 copies per volume. Lowest threshold for a week in July was 17,402. So if they get the standard level of Oricon reporting, they’d have been a good 6-7k below the thresholds each week. Definitely another case of Oricon-invisible slow burning success.